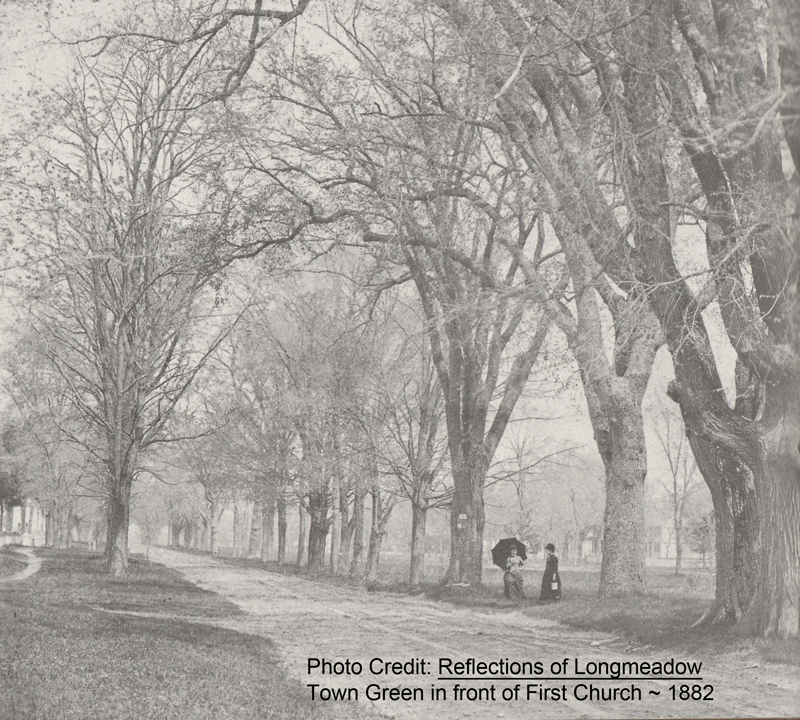 The Town Green has been the focal point of life in Longmeadow for a long time. This summary (Part I) looks at the changing landscape of the Town Green from the late 1700's to the early 20th century. Proceedings at the Centennial Celebration of the Incorporation of the Town of Longmeadow (aka "The Centennial Book") was published in 1884 for the 100th anniversary celebration of the incorporation of Longmeadow in 1883. It contains a wealth of information about the first hundred years including the history of the Green. 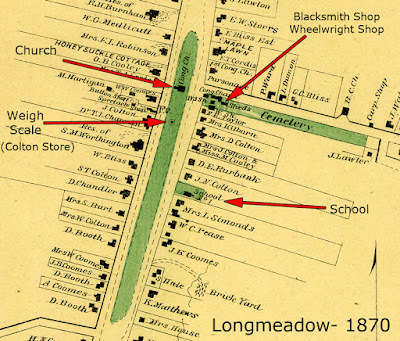 In addition, a review of the historic Longmeadow maps (1831, 1855, 1870, 1894, 1910 and 1920) of the Green provides some great insight as to its history. Prior to 1831 there were numerous shops on the Green as well as a School House and the Meeting House. These shops were granted 40 year leases on the Green with the last lease starting in 1795. 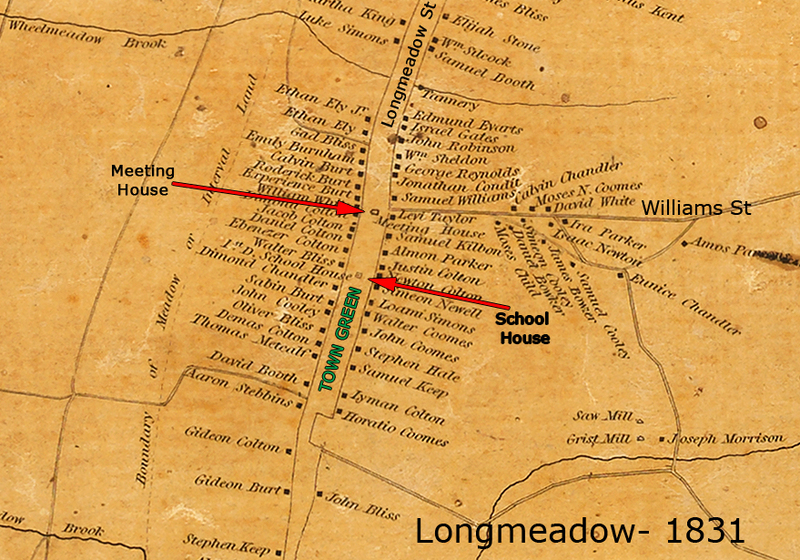 The 1831 map shows only the School House and the Meeting House (--> Congregational Church) remaining on the Green. There were no shops in 1831 since most of the leases had expired and town leaders decided to remove them from the Green. The 1870 map shows only the Congregational Church and the weigh scale(?) for the Colton Store. The School House located on the Green was destroyed by fire in 1852. 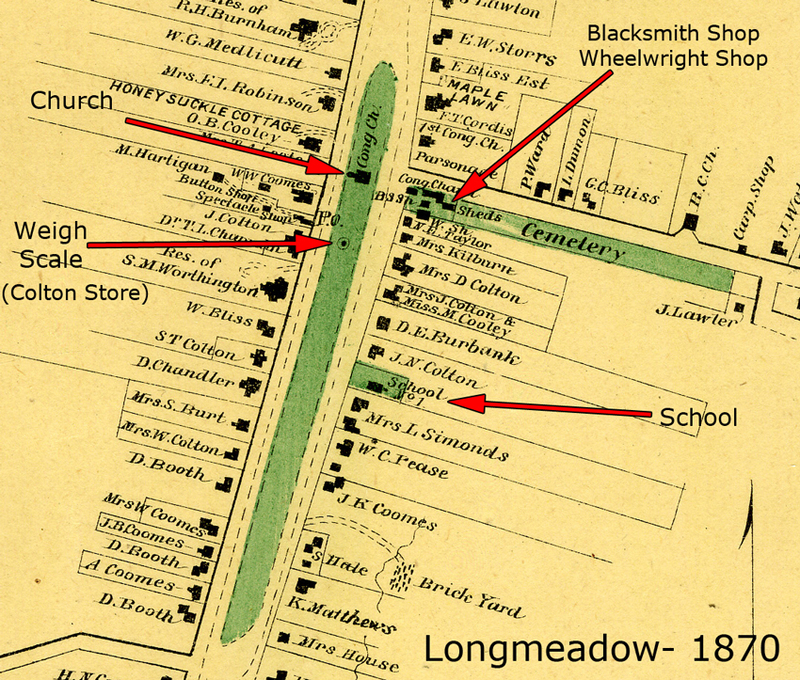 Two shops (marked sheds on the 1870 map)- the blacksmith and the wheelwright had been granted leases for a section of land west of the Olde Burying Yard but these shops were not removed when the leases expired. The owners eventually achieved legal ownership (squatter's rights?) 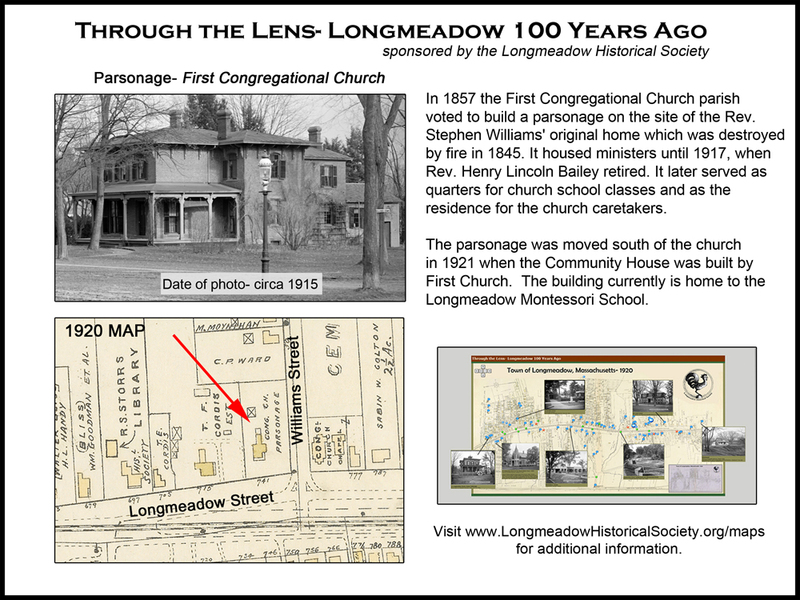 and the Parish was required to purchase the properties when the Congregational Church was moved from the Green to its current location. In 1874 the Congregational Church was moved to its current location and at that time there were no visible structures on the Green. 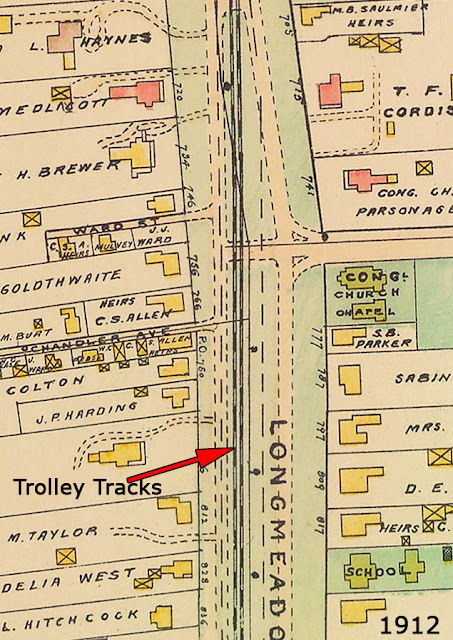 In 1895- the Springfield Street Railway was granted a "franchise" to operate a trolley service from Springfield, MA to Enfield, CT along Longmeadow Street. 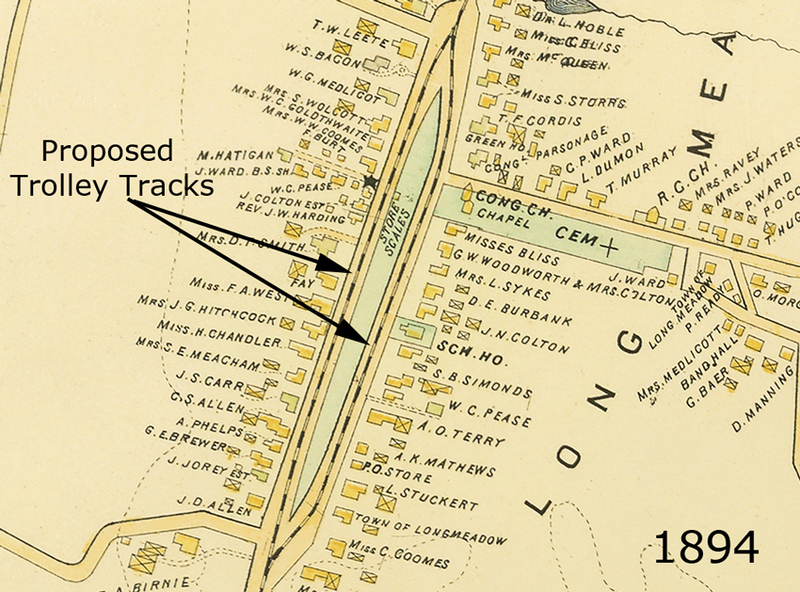 It is interesting to note that the original proposal on the 1894 map showed the trolley tracks + electric power poles/ lines avoiding intrusion onto the Green. 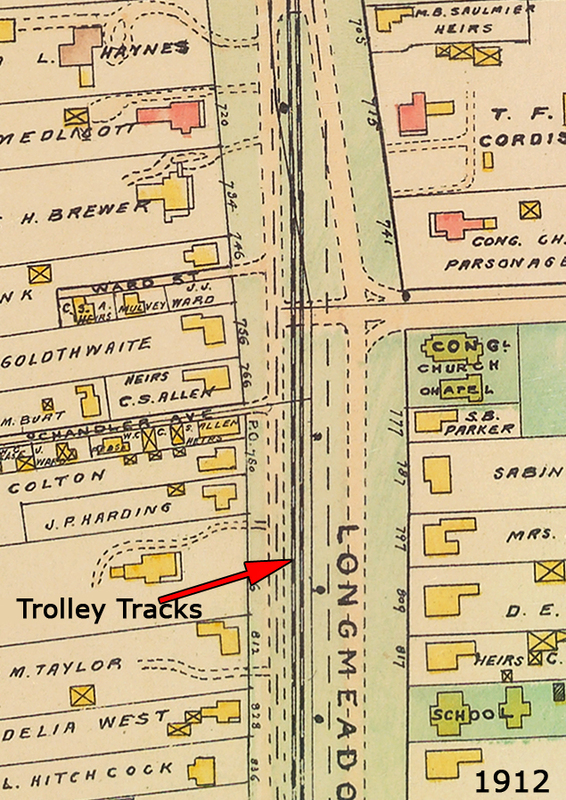 However the 1910 map shows the actual north/south trolley path being placed directly on the Green. 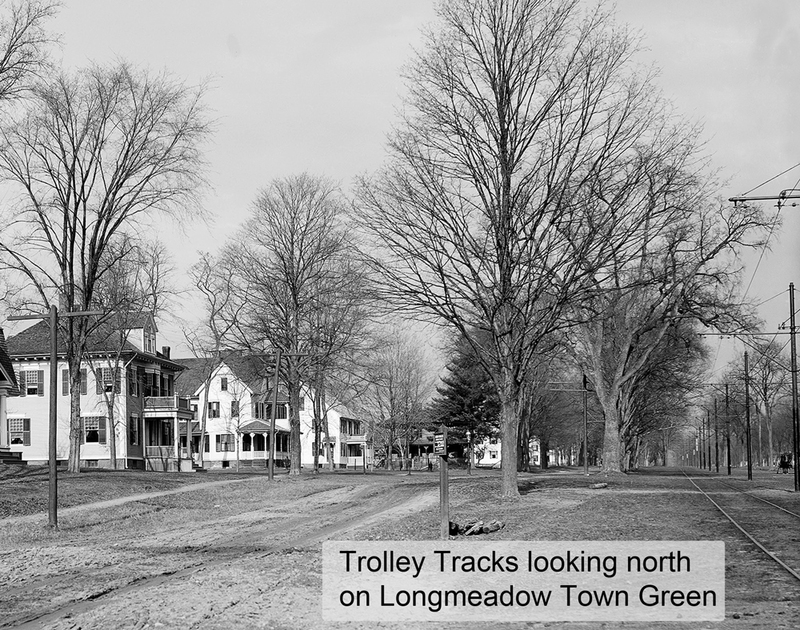 For 40 years (1895 - 1940) trolleys transversed the Green carrying Longmeadow residents and others to their destinations. "THE BROAD AND BEAUTIFUL LONGMEADOW STREET has been at different times the subject of many votes, showing how narrow has been its escape from the most serious encroachments, urged in the interest of individuals, or even of the public itself. It may surprise some to learn that the present central section of park-like sward was originally a long sand-drift, -similar to many now found in the wood-belt eastward, and that this was reclaimed and converted into its present verdure by a process of enrichment and cultivation extending over several years, carried on by a citizen (Capt. Calvin Burt), who was permitted for that purpose temporarily to enclose a long section of the street. 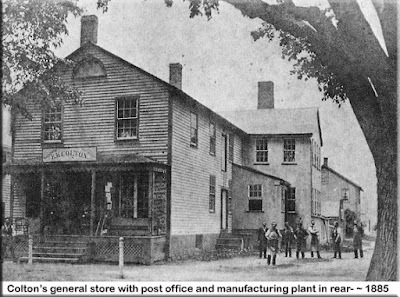 The northern half of this same central section was also by town permission occupied for many years by a central series of shops, stores, and manufactories, under forty year leases, in the same way that the front portion of the Burying-Ground grant was permitted to be occupied by a blacksmith's and a wheelwright's shops." "These last [blacksmith and wheelwright shops], unfortunately, by unchallenged occupancy for more than forty years, gained finally a title to the land itself which it cost the Parish several hundred dollars to extinguish when this corner was desired as a site for the remodeled Church edifice in 1874. Fortunately the danger was earlier discovered in regard to the Main Street [Longmeadow Street] leases, and the removal of all those buildings was secured at the expiration of the lease-term- while a sentiment of jealous and loving care now exists which would make their renewal forever impossible." The Town stopped granting 40 year leases to build shops in the street (Town Green) in 1795. 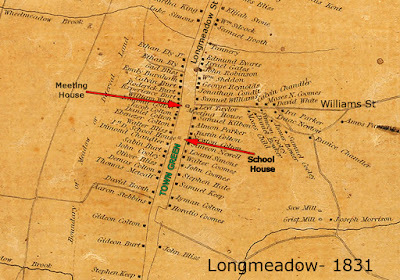 By 1831- because of expired and unrenewed leases, there were no shops remaining on the Green- only the School House and the Meeting House (see Figure 1 below). The School House burned down in 1851. The 1870 map in Figure 2 shows the sheds which are the blacksmith and wheelwright shops referred to in the above passage. Because the blacksmith and wheelwright shops (west of the Olde Burying Yard) had been in place for greater than 40 years, the renters became owners (squatter's rights ?) and the Parish was required to purchase the land when the Congregational Church was moved from the Green to its current location in 1874. By 1870 the only remaining structure on the Green was the Congregational Church which was moved to its current location in 1874 (see Figure 2). The Old Country Store built by Calvin Burt and Stephen Cooley in 1805 remains today as the Spa-on-the-Green/ Dr. Glen Brooks as the only commercial business on the perimeter of the Town Green. 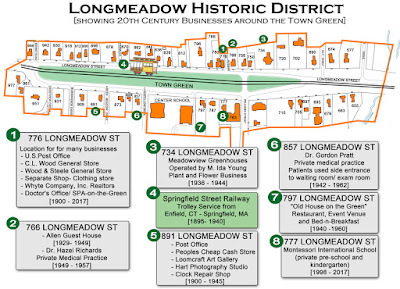 After the split of East and West Villages of Longmeadow on July 1, 1894, the Springfield Street Railway launched a commercial enterprise to provide trolley service from downtown Springfield to Enfield, CT. 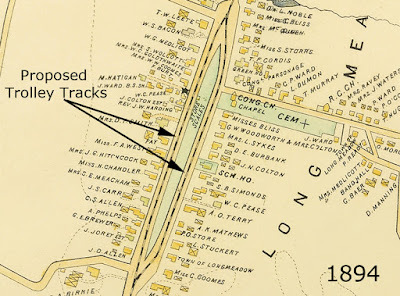 The original layout of the trolley tracks shown in the 1894 map (see Figure 4) avoided use of the Town Green but the final implementation actually utilized a significant portion of the Town Green for the tracks and electric power poles/ wires (see Figure 5). Trolley service was initiated in 1895 and the last trolley run was in 1940. 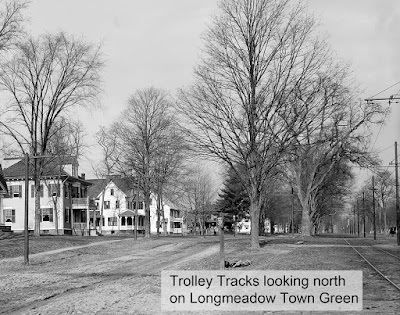 Below is an Emerson photo- Figure 6 (courtesy of the Longmeadow Historical Society) showing the trolley tracks traversing the Town Green. The next increment of this story is Town Green in the 20th Century- stay tuned! About 17 years ago the Town of Longmeadow sponsored an intensive study of long range issues facing the town. 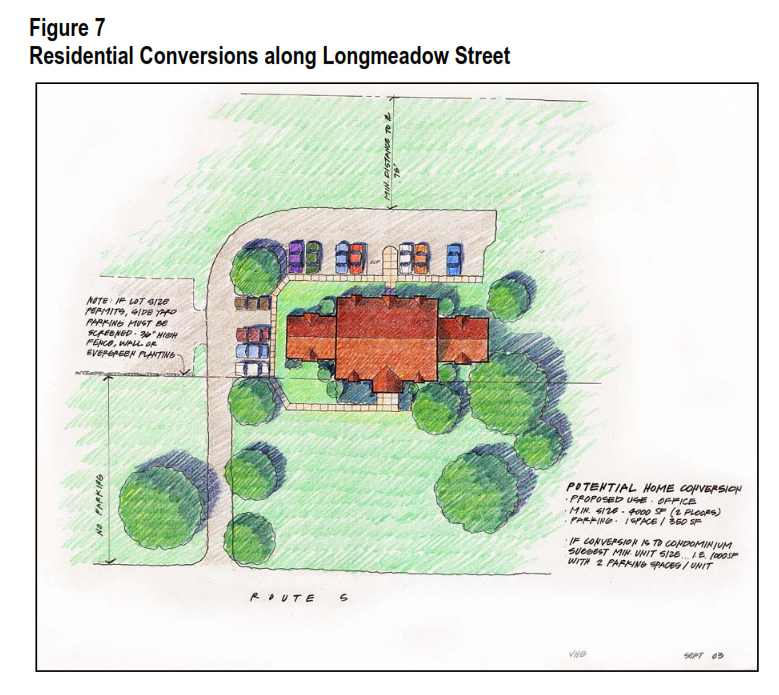 The report issued in 2004 highlighted and recommended the possible need at some time in the future to allow selected conversion (repurposing) of large historic homes on Longmeadow Street to professional office use. 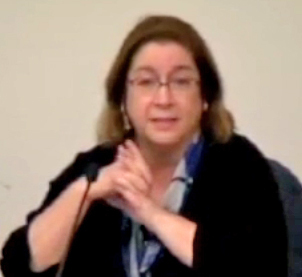 In May 2000 a task force of 14 people- including both town residents and elected officials was formed to study long range issues facing Longmeadow. There was $60K of funding to hire consulting companies Vanasse Hangen Brustlin, Inc. of Watertown, MA and RKG Associates, Inc. of Durham, NH. The Pioneer Valley Planning Commission of Springfield, MA also played a key role in this study. A public forum held at Bay Path College in February 2001 which I as well as many other town residents (120+) attended in order to provide inputs to be considered by the task force. 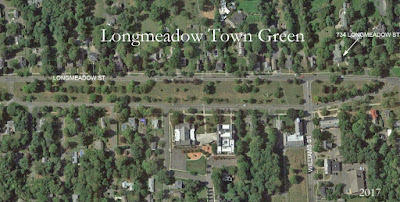 After almost four years and many hundreds of hours of effort a 116 page report: Longmeadow Faces the Future: The Longmeadow Long Range Plan (click link to view full report) was issued in April 2004. One of the issues studied and detailed in the report was Housing. Here are some details developed by the task force and the professional consultants. "In the future, if large houses on Longmeadow Street no longer prove desirable for single family residences, and either do not sell as residences or begin to fall into disrepair, the Town may wish to consider an overlay zone with strict design guidelines to permit some homes to be converted into professional offices, bed and breakfasts, or condominiums. Creative site and design review would preserve the historic character of the area." "The third strategy considered for this analysis was to allow certain properties on Longmeadow Street to transition from single family residential to office or mixed-use over time. 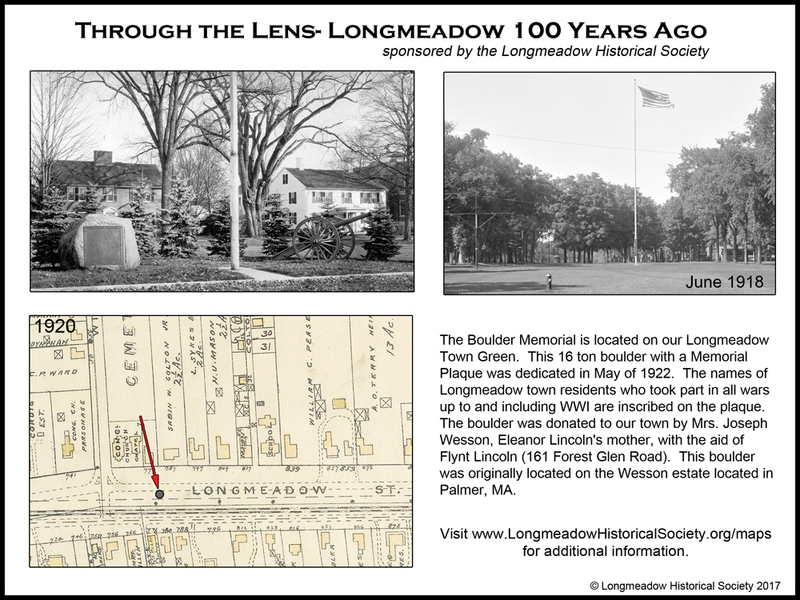 There are many stately and historic homes located along this corridor, and there is strong support in the community to preserve the historic character of Longmeadow Street. There is also no evidence at this time to indicate that these homes have become too expensive to maintain as single-family residences. Property values on Longmeadow Street are high and the corridor remains a desirable residential location." "It is not the Town’s preference to change Longmeadow Street into a commercial corridor. However, offering property owners the flexibility to locate office uses within larger homes on adequately sized lots may be necessary in the future, if the cost to own and maintain these residences continues to escalate. The consultant team proposes that the Town consider allowing some commercial uses along the corridor, in strictly controlled cases, within larger structures and on lots with sufficient area to accommodate off-street parking." "There was a recognition by the group that most houses on Longmeadow Street were either too small in size or lacked sufficient land to be consider for a home conversion to professional offices." It is interesting, possibly only coincidental, but the above diagram showing a potential home conversion to professional office points to 734 Longmeadow Street- the Brewer-Young mansion. 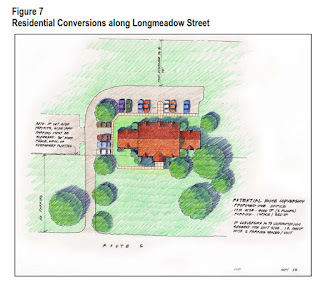 Figure 7 (see below) from the Long Range Plan report shows a possible conversion of this property with suitable landscaping and necessary to maintain the look from Longmeadow Street. This design is very much in keeping with a similar design proposal being offered by the Longmeadow Historic Partners, LLC group. The plan outlined by the Longmeadow Historic Partners to preserve the 132 year historic Wolcott-Brewer-Young mansion and repurpose it to professional office use is in keeping with the recommendations as outlined in the Longmeadow Long Range plan issued in 2004. 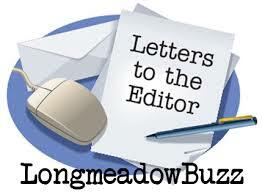 This opinion column was submitted to the LongmeadowBuzz blog by Alex Grant, a resident of Longmeadow and a former member of the Longmeadow Select Board. The Brewer Young mansion was the home of rich people, and the house, its outbuildings, and grounds had the trappings of grandeur from a bygone age. 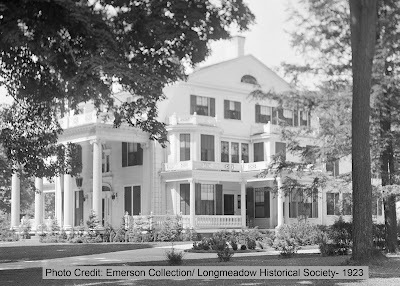 The Town of Longmeadow will decide whether it will permit that mansion to be converted from residential to professional use, which is the only viable plan to save the deteriorating structure. This residence of more than 10,000 square feet rests in the historic district on the green, and we must decide whether to hold fast to an abstract notion of historical purity, even if it means losing the mansion altogether. 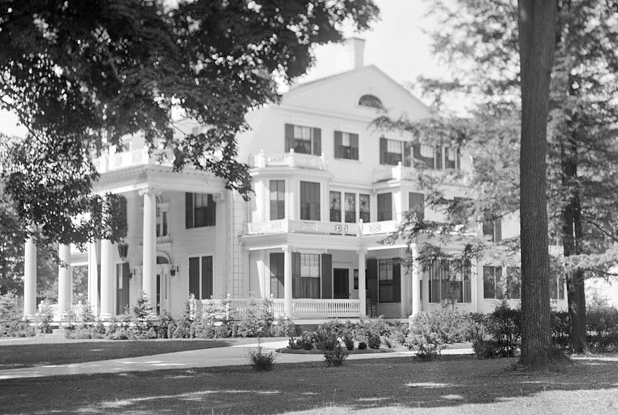 The mansion was built in 1884 and had a succession of short-lived owners until Mary Ida Young, reaping the fruits of the Absorbine Jr. fortune, took hold of the property from 1922 to 1960. It had its heyday during the Mary Ida era, boasting a large carriage house and a racetrack for horses that extended down toward the river. The historical record shows that the mansion was the very picture of an extinct gilded age, of teas and dances and garden parties, a world of servants and footmen and gardeners, straight out of the Great Gatsby. In recent years, the owners of the mansion have either had a lack of money or lack of willingness to maintain the place. The racetrack is long gone. The carriage house has been sold and converted to a residence, and the great house has been ravaged by time and neglect. The peeling paint, evident for years, is just the most outward sign of decline as the house has suffered from more fundamental failings. One of the great columns supporting the porch roof collapsed and had to be replaced with an unsightly wooden beam. Water has leaked through the roof, destroying plaster and causing other damage. The property has suffered many indignities, including foreclosure by the bank and occupancy by a renter who had to be evicted. The house is probably close to being unsalvageable. The days of orchids growing in the greenhouse, the pond stocked with koi fish, a menagerie of horses, peacocks, swans, pheasants, deer, and sheep residing on the expansive grounds are dim memories. As one writer put it, Mary Ida Young is probably rolling over in her grave. Into the breach has stepped a group of investors, willing to invest a king’s ransom to restore the mansion, but to make it into professional office space. After all these years, not a soul has come forward with the funds and desire to live in the house in the grand tradition of Ms. Young. There are some who want to keep the mansion a residence, as improbable as that option appears to be. They want to keep the mansion just as it was. To them, there is a psychic benefit in knowing that some wealthy tycoon is living in the property even if they themselves never set foot in the place. This attempt at historical purity shows a willful blindness to the lessons of history. The train of human events is an unending pattern of fortunes made and fortunes lost. Rising action and falling action. Ascension and decline. Periods of prosperity and periods of depression. Empires rise to great heights, and they collapse. Nothing is guaranteed, and nothing stays the same. Great men and women can achieve immense wealth and power, they can hold the fates of multitudes in their hands, and yet they are as mortal as the rest of us. When they die, they cannot take their fortunes with them, and they cannot control the upkeep of their properties. Mary Ida Young may roll over her in her grave if she could see the desecration of her home, but that is all she can do. Mansions, like any other house, require constant affirmative acts to maintain their splendor, and it is left to the living to choose whether to take those actions. Time is not kind to great homes. Monticello, the architectural marvel designed by Thomas Jefferson, fell into decay soon after his death. His heirs lacked his aptitude to consistently secure loans he could not repay. Mount Vernon, the house and estate owned by the great George Washington, nearly fell into ruin a few decades after he died. It was left to the Mount Vernon Ladies’ Association, a philanthropic group, to bring the property back from the brink of complete destruction. Even today, those two estates depend on a steady stream of paying visitors to stay afloat. It should be no surprise that a mansion in Longmeadow with a less impressive pedigree would decay over time. The plan to restore the mansion and to achieve its original look, albeit with some interior modifications, is a remarkable gesture toward a property whose significance may be driven less by its impact on local history than by a fascination with the lives of the rich and famous. For historical preservationists, this is as good a deal as the Brewer Young mansion will ever get. This article was sent to the LongmeadowBuzz blog by Mark Gold, Member, Longmeadow Select Board for publication. 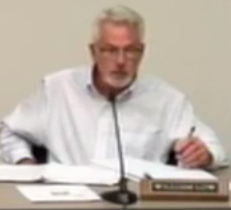 Thank you, Richard Foster, for correcting an error that could have cost the taxpayers of Longmeadow $50,000. The issue is the purchase of a snow plow. The story is complex. At its meeting on October 21st, the Longmeadow Select Board was asked to authorize that Article 5 be placed on the warrant for the Special town meeting that is being held on Tuesday, November 7th. 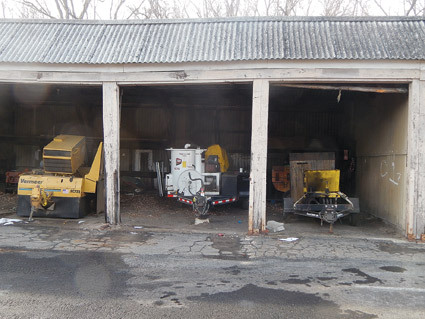 Article 5 seeks town approval for the purchase of a truck, plow, and sand spreader to replace the vehicle that was destroyed in the tragic accident that took the life of DPW employee Warren Cowles last winter. The town manager proposed that the town appropriate from various funds, a total of $225,000 for the purchase of a replacement vehicle. The “leftover”, but new, 2016 model vehicle was available immediately, and would assure that the DPW entered the 2017-18 snow-plowing season with a full complement of plows. The requested vehicle was, by several thousand pounds and over 100 horsepower, larger than any that had previously been purchased by the town. 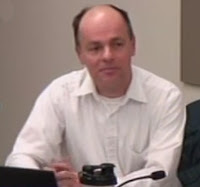 During the discussion on accepting this warrant article, Mr. Foster opposed its adoption on procedural grounds: the specifications had not been vetted through the town’s Capital Planning Committee and there had been no review of the vehicle with the fleet management study and plan that had been adopted by the Select Board several years ago. I opposed the placement of this article on the Warrant because I felt the vehicle was too large and $50,000 more expensive than the purchase of an equivalent replacement. The Town Manager and DPW Director argued that the timing and availability made the purchase of this vehicle essential to assure the proper care of town roads this coming winter. On a vote of 2-2 (Ms. Angelides and Chairman Lachiusa voting for the measure, Mr. Low being absent) with Mr. Foster and me voting against the placement of this article on the warrant, Article 5 did not receive the majority vote needed to approve its placement on the warrant. The Select Board proceeded to consider additional warrant articles. 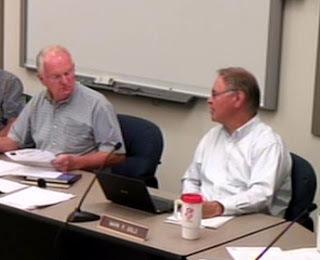 More than 15 minutes after the vote was taken on Article 5, Town Manager Crane asked that the Board reconsider the vote on Article 5. 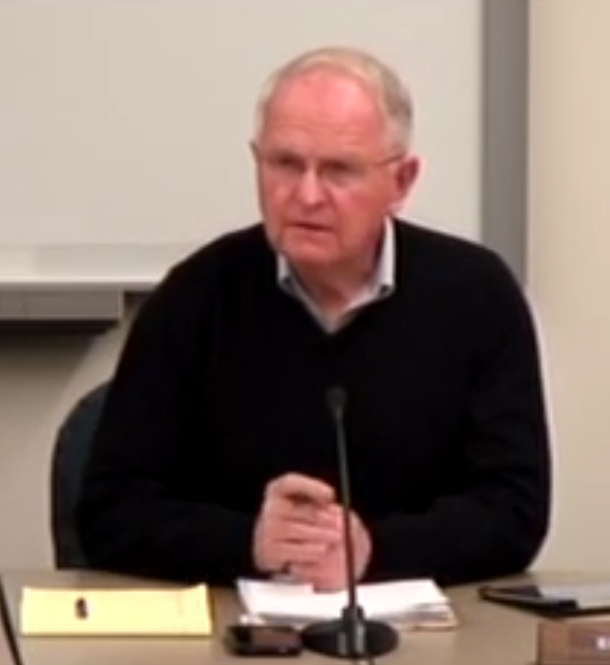 He noted his concern about the need for the plow and the importance of having the purchase of the plow approved at the November 7th meeting. The chair accepted Mr. Crane’s request, and a motion to reconsider was approved. During the reconsideration, an additional 20 minutes of discussion took place. It was noted that the long lead time for most DPW vehicles was such that if the appropriation were delayed until the May, 2018 town meeting, it was likely that the town would be without a replacement snow plow for both the 2017-18 AND the 2018-19 winters, but by appropriating funds now, although we would be short one plow this winter, we would have the plow in time for the 2018-19 season. My background as former chair of the Capital Planning Committee gave me the confidence to know what a snow plow should cost, and I was willing to approve the placement of a warrant article for $175,000 on the Special Fall Town meeting warrant as a way of assuring that the Town wasn’t short a plow for the next two winters. Among the variations considered to get this article approved for placement in the Warrant was indeed to revise the appropriation from $225,000 to $175,000, with the intent of more closely examining the vehicle specifications prior to Town Meeting. essentially answered with “well I did”. When a vote was called, the reconsideration of Article 5 passed by a vote of 3-1, with me being the only dissenting vote. Early the next morning Mr. Foster called me and noted that his personal review following the Select Board meeting identified that the truck that was being recommended for purchase through Article 5 was indeed too large – it was not in compliance with the DPW fleet study and was probably $50,000 more money than the town needed to spend. Mr. Foster then took it upon himself, over the next two days, to work with the DPW staff to identify the properly sized replacement vehicle. On Wednesday, October 18th, Mr. Foster and I requested that a special meeting of the Select Board be called to change the dollar appropriation request in Article 5 on the Special Town Meeting Warrant. That meeting was called for 5PM on Friday, October 20th. Between Wednesday and Friday, the DPW found an appropriately sized truck, plow, and spreader assembly that was available for immediate delivery. The cost of the appropriately sized 2018 model vehicle was $175,000 – precisely the $50,000 reduction that had been discussed at our Monday meeting. On Friday, October 20th, a special meeting of the Select Board was held to revise the wording of Article 5 of the November 7th Special Town Meeting warrant. By vote of 4-0 (Ms. Angelides was unable to attend at that time), the Select Board revised the article to ask that Town Meeting approve the purchase of a truck, plow and spreader assembly that reflects the reduced purchase of the properly sized vehicle for a total cost of $175,000. Again, I write this story because I believe it is important for Longmeadow Town residents to know that the system does indeed work. Mr. Foster’s diligence in examining the proposal, and his willingness to turn his realization that his vote was wrong into action, is worth noting. The initial vote was taken during a regular, televised, Select Board meeting, and based on the communications I received, was noted by many. 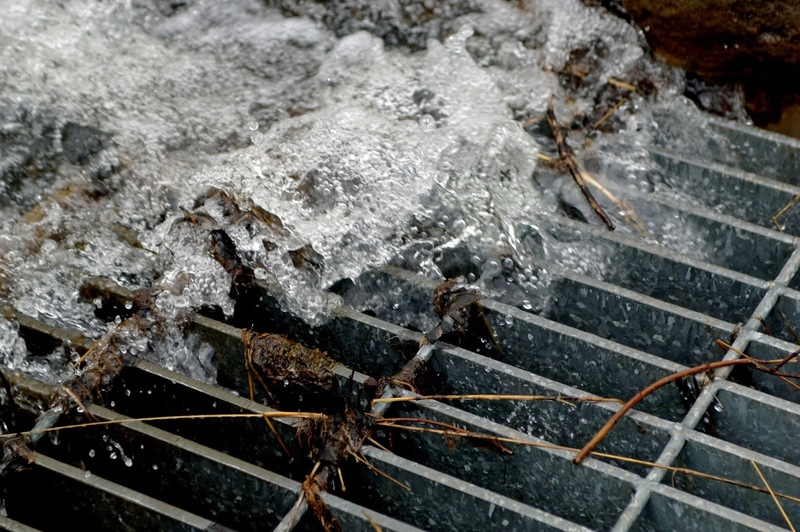 This corrective action was taken in a special meeting not widely communicated to residents. 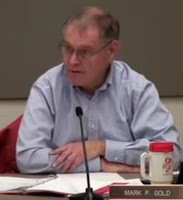 $50,000 is real money, and town residents need to know that although there may be those who would short-circuit the review and approval process in the name of expediency, there are others, like me and Mr. Foster who, in fact, spend the town’s money with the same care as they spend their own. I have chosen to communicate this story, and thank Mr. Foster publicly in this manner, because I will be on a medical leave that will prevent me from thanking him at the next Select Board meeting or at Town Meeting, and I believe that Town Residents should know that the controversy and disagreement they heard in the televised October 16th meeting have been resolved. It is in the town’s best interest to approve the revised Article 5 as it now appears on the Special Town Meeting warrant for November 5th. Bill Low, a member of the Longmeadow Select Board shares the reasons for his vote last month to continue a single property tax rate (vs. split tax rate ) for residential and commercial property owners. Every year the town Select Board must vote to have a single or split tax rate. The split rate creates a separate rate for residents and commercial/industrial property owners. The intent of a split rate is to shift more of the tax burden onto businesses, presumably because they make a profit, as opposed to home owners who are just supporting town services. When a City, like Springfield, with 20%-25% of the real estate classified as commercial/ industrial/ personal shifts the tax to that category, it can make a big difference to home owner’s tax costs while raising the business owners by a nominal amount. Don’t misunderstand; Springfield’s commercial tax rate is the highest in the state and, in many people’s minds, stifles new business development, but homeowners still benefit with a lower tax rate. However, as is the case in Longmeadow with less than 5% categorized as commercial/industrial, a split tax rate has the following effect: every 1% shift to the commercial owners, raises their rates by $.25 per $1,000 of value ($525 per year on average) and reduces residential rates by only a penny, or $3.50 a year on average. Additionally, the commercial property owners, who are landlords, pass those cost to their tenants. In the case of retail properties, leases are “net” or “triple net” (the terms are misused constantly), what’s important is; the total real estate taxes are passed on to the tenant. With office buildings, the increase is also paid by the tenant via “escalators” or “expense stops” regardless if the lease is all inclusive or a “gross lease”, the increase in any operating expense is paid by the tenant. Regardless of whether the tax rate is split or single, the amount of tax revenue raised by a town in Massachusetts is not effected. So, what does this shift accomplish? In 30 years in the real estate industry I have dealt with large, national companies, public real estate investment firms (REIT's) and small family owned businesses. Small family owned businesses can be put out of business by this kind of increase, while larger companies will pass this cost to the consumer. 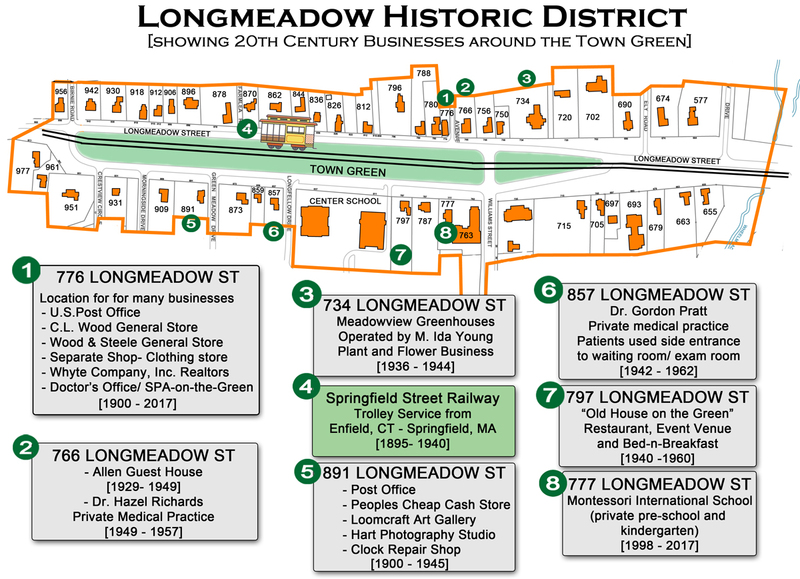 In the case of a town like Longmeadow, it’s a lose-lose proposition.